In a previous post I mentioned that Bob and I try to plan our locations in fairly close proximity to one another in an attempt to hold down transportation costs. When we were planning our current trek, Paris was a definite must for us and we built our other destinations around it. Because it is cheaper to lease a car in Paris and return it there, the City of Lights became our city of arrival and departure. As we were researching where we wanted to live and deciding what our “must sees” were, we realized Paris was within a couple days’ drive of Oktoberfest! This was a definite “Gotta Do” on my list! And Bob was accommodating! Looking through listings on Airbnb I came upon the little town (about 10,000) of Prien am Chiemsee located southeast of Munich near the Austrian border. 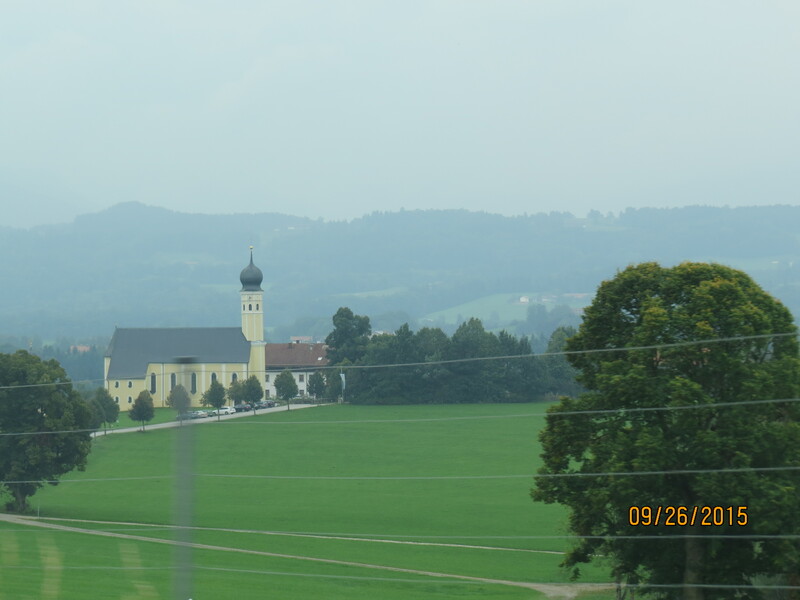 Train service was available from the town into both Munich and Salzburg. 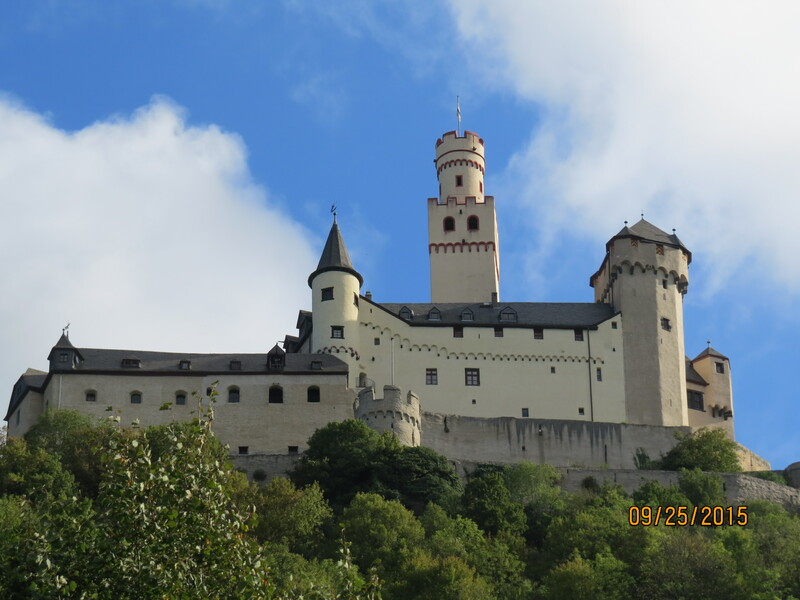 (Figured we had to go check out Mozart’s Salzburg if we were this close!) Both the location and the apartment seemed perfect so we booked it. During our last few days in Caen, we began to plan how to get to Prien. As we looked at our maps, (We find the autoroute numbers are really difficult to follow.) 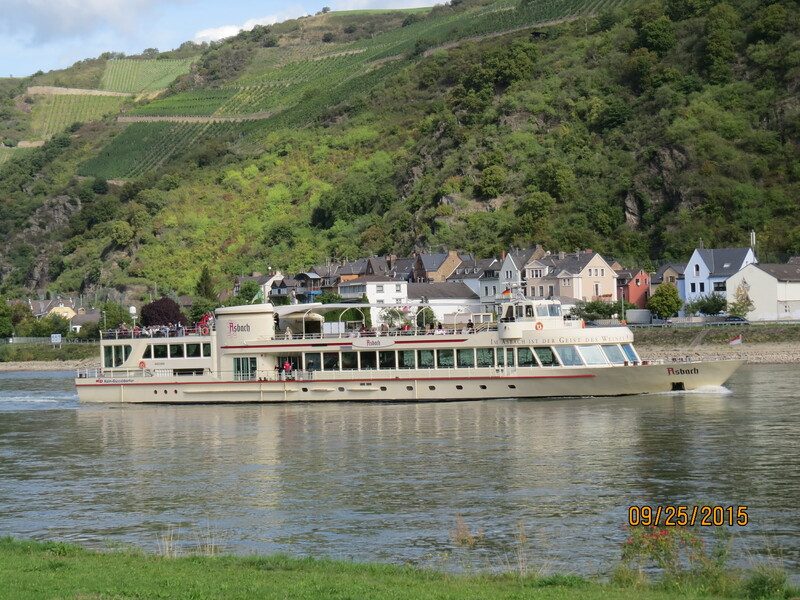 we discovered that by adding less than two hours to the three days we had allocated to drive from Caen to Prien that we could go by way of Koblenz, Germany and drive from there to Mainz along the Rhine. 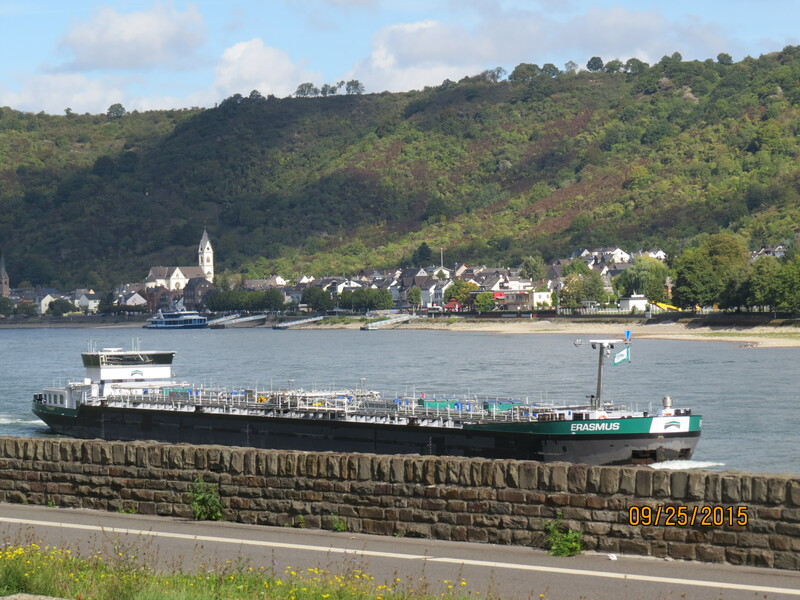 We had seen lots of pictures, read a lot about cruises down the Rhine and decided this was something that we wanted to see, spending the first night in Koblenz, and the second in Baden-Baden (in the Black Forest) then driving on the next day to Prien. We generally make hotel reservations the day before we travel. We do this because we don’t have data except where we have wifi. And we feel more comfortable having a specific destination to aim for. We also try to stay in small European hotels or pensions because they are both cheaper and we meet more interesting people than in the bigger hotels. 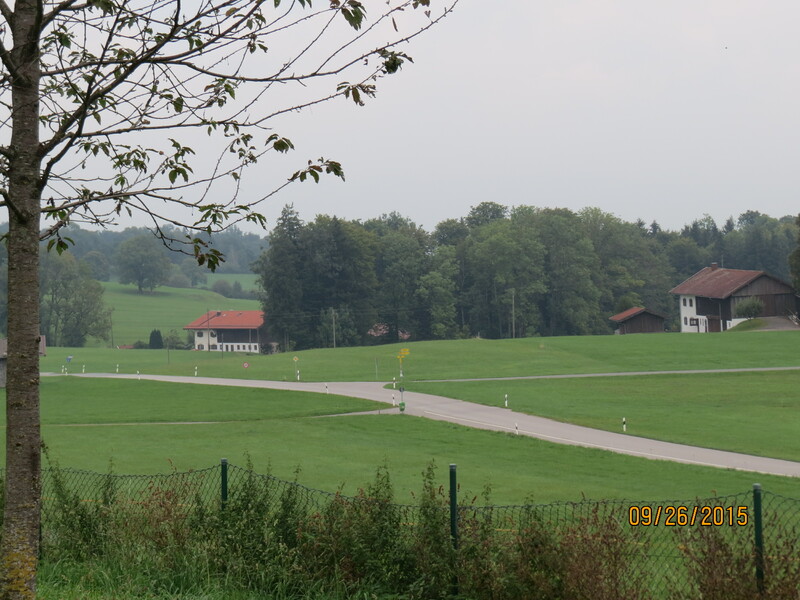 The first day was pretty typical of driving anywhere; European autoroutes, like limited access expressways everywhere, generally lack much in the way of scenery, but as we approached Germany we began to encounter more hills and half-timbered homes. The Scholz Hotel in Koblenz was a wonderful find! I’m relatively certain the woman who checked us in was Frau Scholz. She immediately began speaking English to me and told me she had a larger room for us (at no extra charge) than the less expensive one I had booked because she thought it would be nicer. I needed information about where to park and she inquired where we were presently. I told her Bob was in a “no parking” area in front of the hotel. “Show me,” she said and followed me out the hotel door. No, that was a great parking place. We were fine just where we were. And everything she told us was followed by a big smile. The larger room turned out to have a living room/dining room with a spectacular view of the countryside and a separate bedroom with two twin beds that could be pushed together making a kingsize bed. We went downstairs to the restaurant, where a gracious waitress translated everything on the menu. Bob had a schnitzel, while I had veal in a mushroom sauce. We both had salads. I had a beer; Bob had a cognac. And we both had coffee for dessert. We put dinner on our room tab. When we checked out the next morning after a huge European breakfast buffet, (complete with breads, cheeses, scrambled eggs, hard boiled eggs, a variety of meats and sausages, herring, bacon, fruit juices, pastries, yogurt, cereal and of course wonderful coffee!) 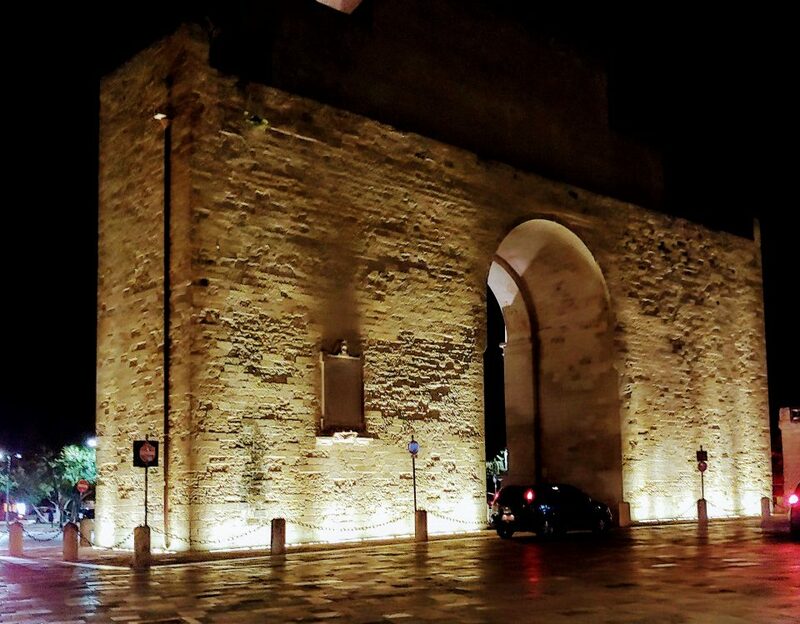 we were pleasantly surprised to find that the bill for our room and dinner the night before came to the total of 115€ (or $128). The breakfast buffet was included with the room, a fairly common practice in Europe. 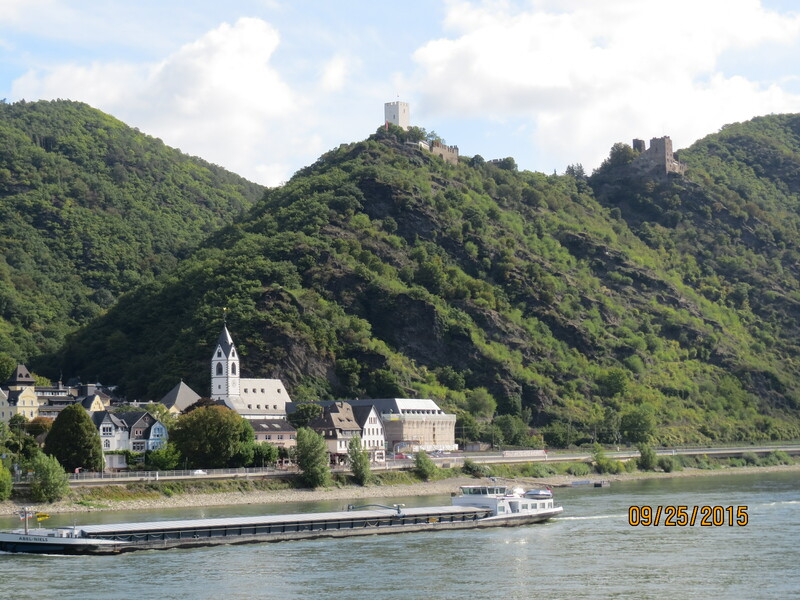 It was a cool day filled with sunshine as we left Koblenz and headed for our drive along the Rhine. The route was a bit difficult to find. We stopped at a roadside park next to the river and asked a local which was the best way to go. He gave us directions and pointed out the castle right above us was one of the most important of the area. The drive was everything we had hoped for and more. Freight barges, and flat cruise ships passed periodically. 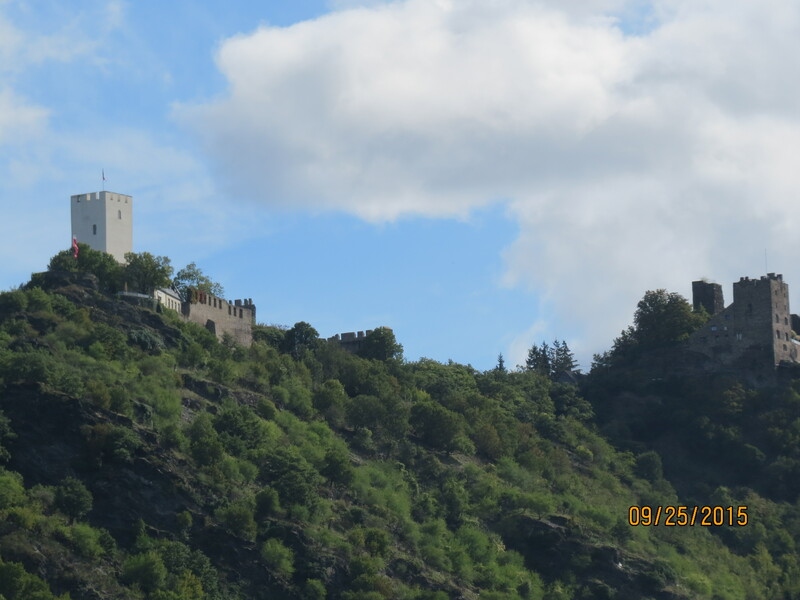 On the hillsides, castle after castle appeared, many of which have been converted into hotels. Near the castles we could still see the remnants of stone fences that served to protect them during the medieval ages. 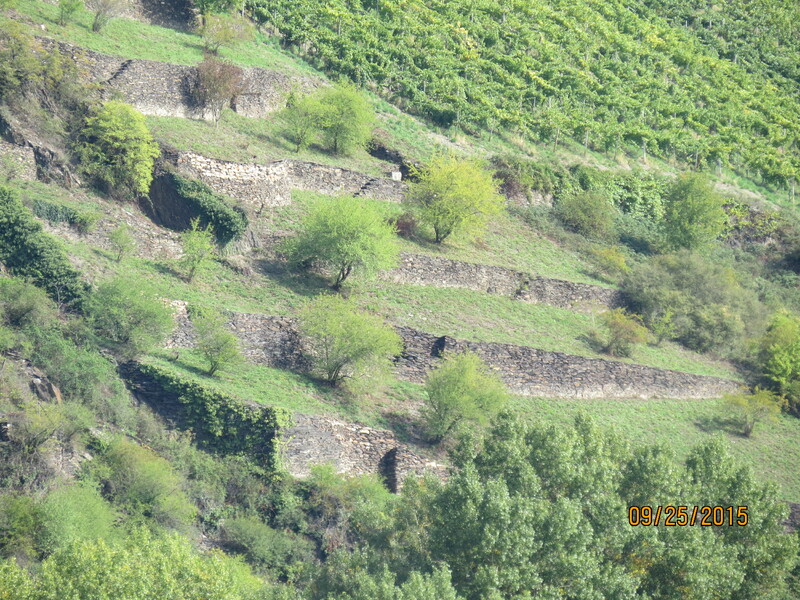 Vineyards covered many of the hillsides. 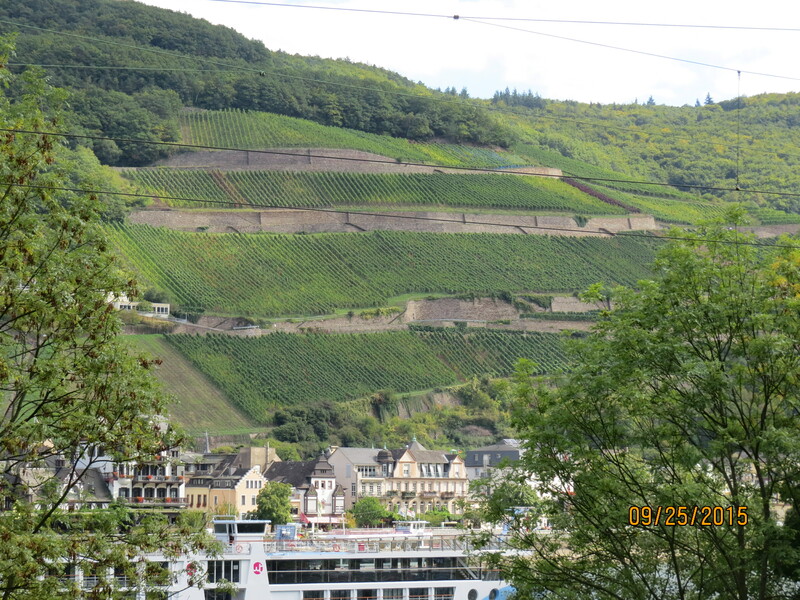 It was about a 4 hour drive from Baden Baden to Prien the next day. Our four hour drives often turn into six because we stop so many times along the way to take photographs, get gas (I think our little Peugeot has about a 30 litre tank),or eat a picnic lunch…usually cheese, bread and fruit. We weren’t sure what to expect in Prien. I knew it was a resort city and I was a bit concerned that at the end of September it could be pretty quiet. Getting off the autoroute and driving the last 10 kilometers really had me concerned. There was a lot of road construction and the area was pretty desolate. But then we arrived in Prien! 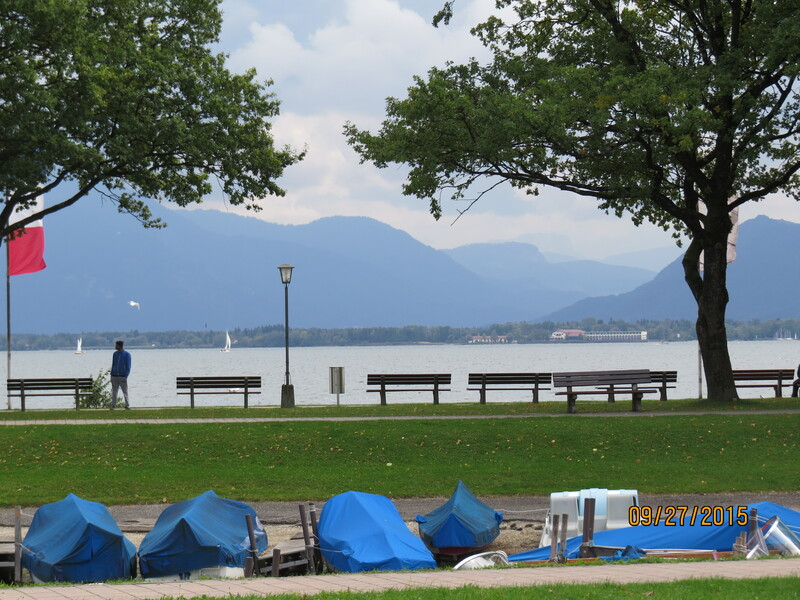 It’s is a gorgeous city on the edge of the Chiemsee, a beautiful large lake. Herrenchiemsee, in the middle of the lake, is where King Ludwig II lived (after building Neuschwanstein and only living spending eleven nights there). We definitely are looking forward to the three weeks we are going to be here!